We’d love your help. Let us know what’s wrong with this preview of No Weigh! by Shelley Aggarwal. This workbook has everything you need to achieve connected eating, body positivity and balanced exercise. It will help you stay well informed about how bodies change emotionally and physically in the teen years, and why good nutrition is critical for growth and development. It debunks any myths about diets and 'forbidden' foods and also gives you the tools and strategies t This workbook has everything you need to achieve connected eating, body positivity and balanced exercise. It will help you stay well informed about how bodies change emotionally and physically in the teen years, and why good nutrition is critical for growth and development. It debunks any myths about diets and 'forbidden' foods and also gives you the tools and strategies to avoid potential triggers of disordered eating. To ask other readers questions about No Weigh!, please sign up. Be the first to ask a question about No Weigh! I highly recommend this insightful workbook which uses a plethora of cognitive behavioural, dialectical, and narrative therapeutic approaches to revolutionise healthy eating for teens! As both a teen (for one more year at least) and someone who has struggled with body image, food, and emotions, I found this book to be wonderful. It was short, easy to understand, and loaded with helpful advice that I wish I had gotten when I was just beginning my teenage years. No Weigh! broke down body image, food, and emotion to find where struggles with these subjects come from. Not only did it break these things down scientifically, but it gave both specific and generalized examples to help As both a teen (for one more year at least) and someone who has struggled with body image, food, and emotions, I found this book to be wonderful. It was short, easy to understand, and loaded with helpful advice that I wish I had gotten when I was just beginning my teenage years. No Weigh! broke down body image, food, and emotion to find where struggles with these subjects come from. Not only did it break these things down scientifically, but it gave both specific and generalized examples to help the reader understand the point the authors are trying to get across. This book also gave a lot of exercises for the reader to do to help deal with some of the struggles that come along with being a teen. These give the reader a real life way to begin dealing with issues in a positive and constructive way. I honestly think that this book is going to be able to help a lot of people, and what is amazing about it is it is not geared towards a certain gender or age: it is all inclusive. Give it to any teen and they will come out of reading it with new skills to help them through navigating the teen years. 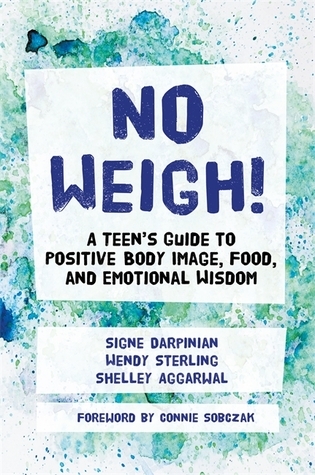 A simple guide and workbook for teenagers about facing body image, weight and health issues. This is a positive guide to help teens reevaluate how they view and judge themselves and their body from not taking the scale at face value or comparing themselves constantly to others in the media or around them. With space to write and tips for thought changing, this book will help them understand and adapt their bad thoughts into positive ones to help them in the future and grow from where they are now. A simple guide and workbook for teenagers about facing body image, weight and health issues. With space to write and tips for thought changing, this book will help them understand and adapt their bad thoughts into positive ones to help them in the future and grow from where they are now. It may be small but this book could be life changing for many youngsters in my opinion and avoid many body based issues in my opinion. A really well written book that gave great advice and was written in a way that wasn't patronising, but wasn't too adult either. I enjoyed the range of exercises that it provided, and the way it helps in many aspects of life, not just in food and body image. I would highly recommend this book to all young people, and even adults too. This is a very interesting and informative book on body positivity for teens, there are tips for thought changing, which I thought were very helpful. It is short so it will be a quick read but I will be very useful to teens who need it. I would really recommend it. How uplifting! I don't suffer from body image, but if I did this is a great book! Thank you netgalley for the free arc in exchange for an honest review!